Skipping the line at airport restaurants used to be the stuff daydreams were made of-usually the daydreams of travelers with tight connections, employees on limited lunch breaks or parents with hungry kids hanging on their legs as they waited in line. Mobile apps, however, are changing the very definition of "grab-and-go." Orders placed on apps appear in concessionaires' kitchens alongside orders placed in-house and are paid for directly through point-of-sale software. 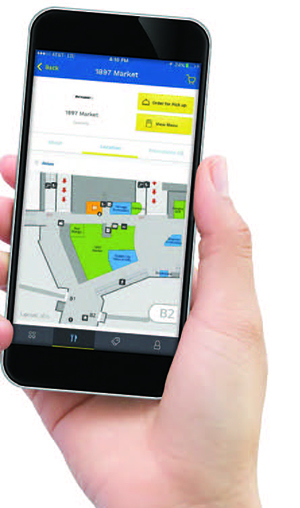 Customers receive text alerts when their orders are ready and pick them up at pre-designated areas. Passengers, airport workers and airline staff alike are thrilled with the chance to order and pay for food and drinks using their smartphone from practically anywhere. Airport operators and concessionaires are excited about the apps' potential to improve service and sales. parking and flight times. This May, however, it integrated an outside app that provides menus and allows customers to order and pay for food using their smartphones. The app, aptly called Grab, even offers turn-by-turn directions to help customers find participating concessionaires. Ken Buchanan, executive vice president of revenue management for DFW, considers the app a great way to capture revenue from customers or employees who may not have otherwise been able or inclined to stop for food. The airport launched Grab by performing a test run with employees. "They went on the app to different locations, placed orders, received the orders, and we all met at a central location and filled out forms on the experience," he explains. The "mystery shopping" format produced feedback for participating concessionaires to help improve the service; and employees received free meals and had a lot of fun, reports Buchanan. In late May, American Airlines, DFW's largest airline, also partnered with Grab and the airport. Buchanan notes that it's often hard to capture sales from deplaning passengers, but this new development might be just the ticket, especially for customers who don't want to make another stop after leaving the airport. "Any time we can give passengers 15 minutes back, we think that is really positive for their experiences," says Mark Bergsrud, chief executive officer of Grab. The integration with American Airlines and DFW is bound to increase usage of Grab, which is already available at 18 U.S. airports and growing quickly, notes Bergsrud. He reasons that infrequent travelers who don't already have the Grab app will find it when they use the airport or airline app as their preferred day-of-travel app. "The integrations will cast a much wider net and bring millions of customers to Grab's airport and concession partners," he explains. Fort Lauderdale-Hollywood International Airport (FLL) in Florida works with two food/beverage management companies, and thus offers two apps for online ordering. Delaware North operates in terminals 3 and 4, and contracts with Grab (pre- and post-Security). HMSHost is in terminals 1 and 2, and is implementing its new proprietary app called Host2Coast. 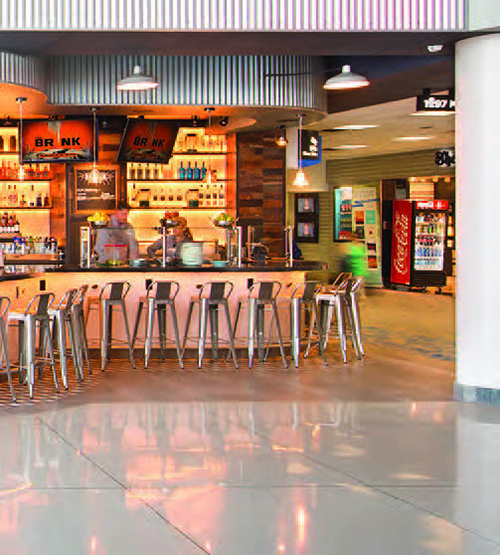 Leanne Andress, aviation business manager of concessions for Broward County Aviation Department, explains that Delaware North introduced Grab slowly at FLL, adding more and more restaurants as word grew. After using the app for a little more than a year now, the company is pleased with the response from passengers and employees. "We're still introducing new people to Grab every day," she reports, noting that grassroots momentum propelled its growth. Delaware North employees introduced customers to the app by handing out cards to potential customers as they passed through the concessionaire's multiple restaurant locations. Word of mouth made a huge difference, comments Andress. "By ordering ahead, passengers can ensure they have meals that suit their tastes without having to worry about lines or whether the restaurants in their terminal have a selection they would be interested in," she remarks. "Anything that improves the guest experience is a plus," adds Tammy Turner, assistant general manager for Delaware North. HMSHost is seeing similar results from its Host2Coast app. The app offers locations, operating hours and menu offerings for all of the company's airport restaurant locations throughout North America. The app launched pre-order and pay capabilities for its casual dining options at FLL and Chicago's O'Hare International in February 2016. It has since expanded to nearly 10 airports, and the company hopes to have the pre-order and pay capabilities available at 50 concessions in 17 airports by the end of this year. Integration with travel companies is also under consideration. Jim Schmitz, vice president of innovation for HMSHost, notes that the company is modifying its app to accommodate vegans, vegetarians and customers with gluten restrictions or other special diets. Users will be able to communicate their specific requirements and preferences through customer profiles set up and saved in advance. "We think those things are very important," says Schmitz. "Airports have to really drive that customer service impact, and we wanted to make the customer experience first in our approach, too." Promoting the app needs to be done in a big way, he adds: "You need to grow a market, and once you have scale, we can really show value to the customer traveling through Chicago to Los Angeles." Airport and concessions personnel note that food-ordering apps don't just benefit travelers and other airport customers, they also benefit employees who work for the airport and airlines. Buchanan reports that DFW staff members love the options and flexibility Grab provides, and employee discounts are automatically applied to their bills with a special code during the order process. Not surprisingly, time-pressed flight crews and other airline workers really appreciate the convenience, he adds. At FLL, concessionaires also got into the spirit. "It was fun the first few days to watch the orders come up on the screens and see which were from Grab," reports Turner. "Now, it's just routine and everyone knows what it's for; but there was a buzz about it at first." Given the app's strong reception from employees, she would like to expand it to include deliveries to the baggage area. "It's fairly simple, because if we have a cashier, Grab is just another guest," she explains. Buchanan stresses the importance of having a critical mass for concessions apps. "Just one or two locations participating does not add enough choice for the customer," he advises. It's also important to train and equip concessionaires with all the needed tools, he adds. At DFW, Grab and the airport both provide training about the app and consider it a collaborative project. "We [the airport] have to go that extra mile to really own this experience, too," explains Buchanan. "We need to be a partner and not just offer a service through another company, because it's also our brand as an airport that's on the line." Turner sees it similarly from the concessionaire's standpoint. She says that an app is just one piece of the guest experience, and the experience as a whole reflects on the airport, airline and individual restaurants. "[Having an app] looks favorable for the airline and the airport, and we have had great unintentional consequences," she reports. "Traveling is tough, and if you can buy minutes, that's a plus." Schmitz adds that HMSHost learned many things while launching Host2Coast, but it learned even more when it created a previous app that was ahead of its time-before the Apple Store and Google Play Store were mainstream options. "Now, people have become comfortable using apps in airports and it's become important," he notes. Given DFW's history of embracing technology, its use of a concessions app is not surprising. Buchanan notes that the airport considers each passenger's visit an opportunity to provide a unique experience based on whom that customer is and what he or she wants. Data-driven technology helps the airport find out what passengers want and how to offer it. The popularity of DFW's app and its 2016 Airport Service Quality Award as the best large airport in North America speak to its success. Schmitz agrees about the importance of personalizing customer experiences. That's one of the reasons he is intent on improving the HMSHost app to accommodate individual needs such as special diets. That's not to say it will be easy. "It's a lot more challenging to get information correct for food via an app-especially for kitchen restrictions," he comments. "We have to make sure they are 100 percent accurate, but we think the effort is important." Airport concession apps seem to have found a place with customers-from frequent flyers and casual travelers to a wide variety of employees. And airports and concessionaires who already offer them say that app-based ordering is here to stay. DFW recently expanded the concept beyond smartphones by launching a version of its app for the Apple Watch. San Diego International Airport also added an interesting twist by selecting AtYourGate, a Grab partner to provide a mobile ordering option and the industry's first delivery of food and retail items anywhere in the airport. This means customers making quick connections can have meals waiting for them at their departure or arrival gates; employees can have snacks delivered to their work areas to maximize break times; and travelers who forget to pack items such as a belt or toothpaste can have replacements in-hand before they leave the airport. "Anything that improves the guest experience is a plus," summarizes Turner. "From the airport director standpoint, this is a convenience for their customers. In today's world, time is a premium.